Disclaimer: I received this ARC courtesy of Delacorte Press through advanced distribution at YALLFest. I am grateful for the opportunity to review an ARC for my readers, but this will not influence my final rating. All opinions expressed in this review are my own and based solely on the book. I received this book at the Get Underlined tarot card reading session during Yallfest, and I don’t think I read my future right. We were allowed to pick 2 books out of the 4 that was there, and I immediately snatched up Come Find Me by Megan Miranda ’cause we know I’m Miranda trash. However, I flopped over the other 3 on what to pick, and I finally went with this one because the cover was really cute. I didn’t put it together until much later that it was by Jennifer E. Smith, whose The Statistical Probability of Love I really enjoyed. This book was…I just…it was just so MEH? There was not much to it. It was just…fluff? filler? fluffy filler? I’m 200% down for fluff, but it has to have actual things behind the fluff. I felt like this book just sat there the entire time, and I just looked at the words, and they tried to make some sense, but they just fell so flat. The entire plot was Hugo and Mae on a train. Mae was trying to find who she was after she was rejected from film school for a film that wasn’t her. Hugo was trying to escape the life of being forever surrounded by his famous sextuplet family. They find their paths colliding after Hugo puts out a request for a Margaret Campbell online, since his train trip across the United States required one after his Margaret Campbell drops out. There was a LOT of potential. I mean, a LOT. I love me some travel stories, some fluffy romance, some emotional depth and reflection. I mean, this characters were going on a JOURNEY – both physically and mentally and emotionally and I was down! I down was down for the train ride. However, every chance this book got it, it just…stalled. The train never started on the track. It just sat there, and I was the car that was needed to get on the other side, and it blocked my way and even looping around it DID NOTHING. The characters were blah. Hugo and Mae were both extremely bland. I didn’t connect with either. I had hopes for the family, but I felt like Hugo’s family just blended together into one big blob. I did like Mae’s dads and her grandmother, but I also felt like Mae’s grandmother became into a bit of a cliche? I had hopes AGAIN that maybe they would run into some cool eccentric characters on their train ride that would be fun and quirky, but everyone felt like the next one. I don’t even remember Mae’s best friend’s name. Merida is not feeling the train – how about some horesies? The romance was…well, it was there. They were…I just…THEY WERE SO EH. I never felt any tension between them. It was very fast and abrupt and SO FAST. I will admit that I can get behind instalove occasionally if done right, but this was just…they were trusting each other fully on the first night and feeling deeps feels. I just. And the romance felt like really the only plot? I mean, they were focused on Hugo setting off on his own and Mae doing movie things, but they didn’t do much to me. There were all the parts together, but I never really connected with them. The best part was the premise of Hugo trying to find Mae, and that only lasted like 40 pages. There was a plot twist was entirely predictable, and I was just 200% done with it at that point that it made zero impact. Just…I…I don’t even know. The cover is really cute, though? This book gets 1 crown from me and a Merida rating. I don’t hate it with a fiery passion, and there wasn’t anything extremely wrong or problematic with it. It just…it just sat there. It would sat there, and I would look at the cover, and that was at least goodness. But it just didn’t have a flow or deep connection for anything. What’s the last book you read that wasn’t terrible, wasn’t good, but was kind of just “a book you read”? 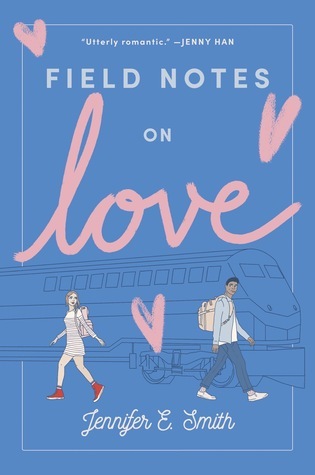 Posted on February 11, 2019 February 8, 2019 by Mandy @ Book Princess ReviewsPosted in UncategorizedTagged arc, arc review, blog, book blog, book blogger, book blogging, book review, contemporary, field notes on love, jennifer smith, mystery, new release, romance, young adult. Agreed! A good journey usually accompanies. But yes! Statistical Probability was so much greatness, and this just… 😦 It wasn’t classic goodness. So sorry to let them not continue the float. Aw, that’s too bad. I enjoyed Jennifer Smith’s fluffy romance books and I’m actually looking forward to this. Sounds disappointing. And I love how honest you are here! Yes! Her fluff used to be so much greatness. It just felt like wandering fluff without a direction? 😦 Thank you! That’s too bad 😕 Romance is still tricky for me. I prefer paranormal romance so the plot doesn’t rely solely on the relationship. Oooh yes! Paranormal does seem to find a pretty good balance between suspenseful plot and romance. Love the honesty, and can totally relate to the disappointment of reading a book that had so much potential. Better luck on the next book! Thank you! And yesssss. 😦 I think those are the worst kinds of disappointments. Thank you! Awwww, that’s so sad! I’ve had good and bad experiences with Jennifer E. Smith, and I’m sad to hear that this one probably wouldn’t be a good time for me either. Oh no another MEH book!!!! I’ve been having a lot of these lately. Books with no lasting impact feel like such a waste of time, but the promise of potential keeps me reading and it often doesn’t work out which is even more disappointing. Sorry Mandy, maybe the next one will be better. Yes!! With a good premise and you can spot the potential, it’s just so hard to say bye bye, but then you’re stuck and crying and going why did I waste my time. XD And hopefully the lowest low have given me a few highs!